study focused on the apolar dioxolane derivatives of 20-hydroxyecdysone. with their complete 1H- and 13C-NMR signal assignment. several plants as defensive agents against non-adapted herbivores . good sources of ecdysteroids of herbal origin . are substituted with 4–8 hydroxyl groups. (α,β-unsaturated ketone) chromophore group is present in their B-ring . have no hormonal effects in humans . mainly containing the isolated ecdysteroid compound 20E . we discussed the possible mechanisms that might be involved in this activity . different pharmacological and pharmacokinetical properties . thoroughly discussed their structure elucidation and stereochemistry . in the presence of phosphomolybdic acid. and structures of the products obtained. the 2,3- and 20,22-dioxolane structures. Table 1. 1H- and 13C-NMR shifts of compounds 4, 6, 22, 30, 33, 9 and 10; in ppm, in methanol-d4. Table 2. 1H- and 13C-NMR shifts of compounds 16–20 and 26–27; in ppm, in methanol-d4. Table 3. 1H- and 13C-NMR shifts of compounds 11–14; 31 and 32; in ppm, in methanol-d4. allows the 20,22-dioxolane ring to form with less strain. could not be coupled at the 2,3-position. afforded the desired 2,3-monoacetonide in a one-pot procedure. two possible diastereomers can be formed at both diols. was achieved in the following way (see Figure 2). Figure 2. Stereostructure of 22.
give the characteristic 1H, and the black numbers the 13C chemical shifts. proving the α position of the R2 = H atom. revealed their cis arrangement and the R configuration around C-29. (irradiation at δ = 4.93 and 4.91, respectively). and most likely originated from an impurity in the trans-cinnamic aldehyde reagent used. ethyl group from the reagent methyl ethyl ketone. serial dilutions of the compounds. 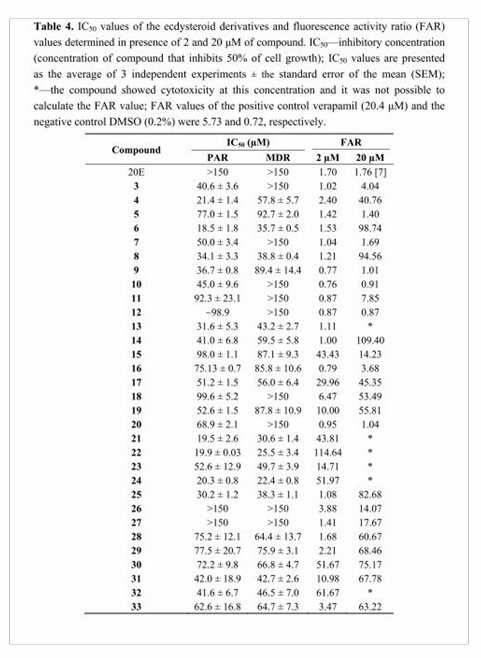 Inhibitory concentrations (IC50) were calculated and are presented in Table 4.
control DMSO (0.2%) were 5.73 and 0.72, respectively. while other compounds show similar activities on both cell lines. which was consequentially retained inside the MDR cell. The efflux pump inhibitor (EPI) verapamil was used as positive control. any effect on the retention of the fluorochrome. where FL is the mean of the fluorescence. 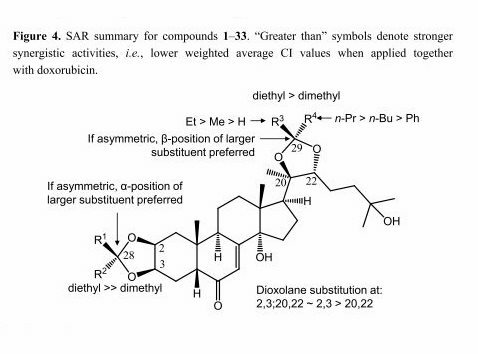 The obtained results are shown by Table 4.
compound 3, very weak in this assay, was able to act in a rather significant synergism with doxorubicin (see below). 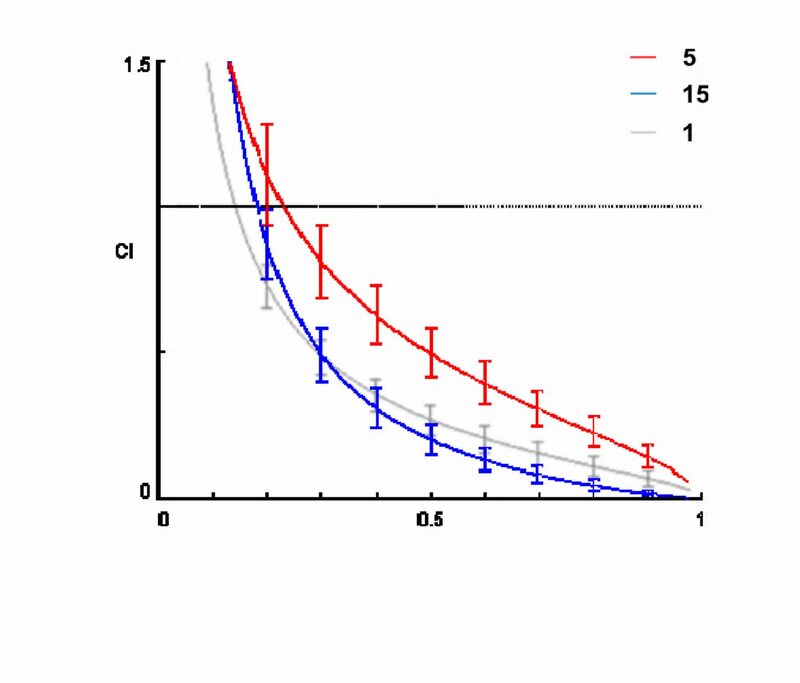 of Fa-CI plot is given by Figure 3 for compounds 1, 5 and 15. Figure 3. Fraction affected (Fa) vs. combination index (CI) value plot for compounds 5 and 15, in comparison with the original lead compound 1.
linear correlation coefficient of the median-effect plot, respectively. Error bars represent 95% confidence intervals by means of serial deletion analysis performed with the CompuSyn software. it is also stronger than compound 1.
where the strongest synergistic effect occurs. 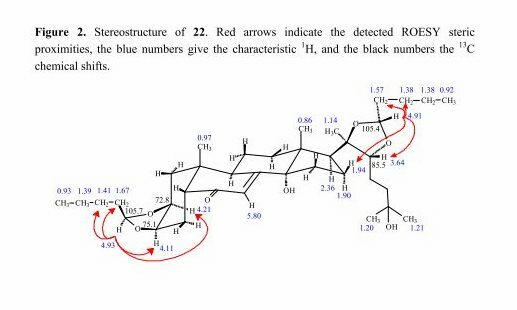 that of the coupled substituents at R1–R4, several novel structure-activity relationships (SARs) were observed. regardless of the compound vs. doxorubicin ratio where this activity was found. for a stronger activity (cf. 11 vs. 12 and 13 vs. 14). the 29α-phenyl substituted derivative (cf. 8 vs. 7, respectively). The observed structure-activity relationships are summarized in Figure 4. Figure 4. SAR summary for compounds 1–33. when applied together with doxorubicin. the aid of the proton-proton coupling pattern (1H-NMR spectra). concentration of 100 mM, and after adding phenylboronic acid (1 equivalent), the mixture was stirred for 30 min. gel with appropriate solvent systems of ethyl acetate-ethanol-water (3, 4) or cyclohexane-ethyl acetate (7, 8, 9-10, 15, 16). The purification of compounds 11-12 and 13-14 started with CC by using solvent systems of ethyl acetate-ethanol-water. 14 (33.7 mg, 20.0%), 15 (27.4 mg, 5.0%), 16 (13.3 mg, 10.2%). 23 (42.3 mg, 6.9%), 24 (36.1 mg, 5.5%), 25 (43.8 mg, 6.7%). 31 (24.8 mg, 40.6%), 32 (38.7 mg, 41.5%), 33 (53.0 mg, 46.2%). as solvent control and no activity was observed. (penicillin and streptomycin) at 37 °C and 5% CO2 atmosphere . Medium, horse serum, and antibiotics were purchased from Difco (Detroit, MI). software (GraphPad Software, San Diego, CA,). Inhibition of ABCB1 was evaluated using rhodamine 123, a fluorescent dye, which retention inside the cells was evaluated by flow cytometry (14). twice with phosphate buffer saline (PBS, Sigma). The final samples were re-suspended in 0.5 mL PBS and its fluorescence measured with a Partec CyFlow flow cytometer (Partec, Münster, Germany). Verapamil (Sanofi-Synthelabo, Budapest, Hungary) at 20.4 μM was used as positive control. assignments are provided. The compounds showed mild to very strong synergistic effects with doxorubicin against the aforementioned MDR cancer cell line, and the diversity of the substituents allowed us to observe several new structure-activity relationships. 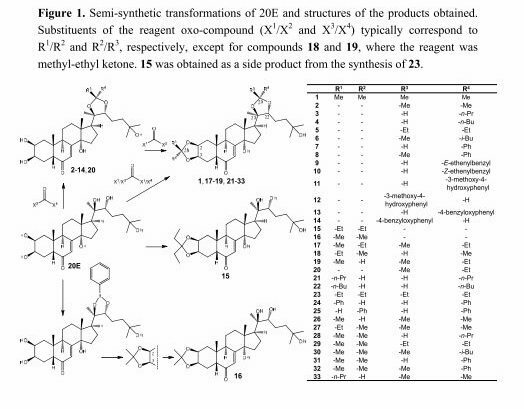 Among these, the importance of the 2,3-dioxolane substitution and the observations concerning the role of stereochemistry at C-28 and C-29 are the most interesting results. Apparently, ecdysteroids can be engineered to become strong MDR modulators only by decreasing the polarity at the A-ring, while the polar side-chain can be kept, providing the possibility for designing such compounds with a reasonable water solubility and high drug-likeness. per os application of these compounds requires an appropriate formulation; development of such delivery systems is currently in process, investigation on their activity against MDR cancer xenografts is going to be reported in the near future. the mass spectroscopic measurements, Imre Ocsovszki, supported by the grant TÁMOP-4.2.1/B-09/KONV-2010-0005, for the flow cytometry measurements and Ibolya Hevérné Herke for the semi-synthetic preparation and purification of compounds 17–20. Berlin/Heidelberg, Germany, 1974; pp. 43–54. 2. Zeleny, J.; Havelka, J.; Sláma, K. Hormonally mediated insect-plant relationships: Arthropod populations associated with ecdysteroid-containing plant, Leuzea carthamoides (Asteraceae). Eur J. Entomol. 1997, 94, 183–198. 3. Dinan, L. A strategy for the identification of ecdysteroid receptor agonists and antagonists from plants. Eur. J. Entomol. 1995, 92, 271–283. 4. Tóth, N.; Hunyadi, A.; Báthori, M.; Zádor, E. Phytoecdysteroids and vitamin D analogues—Similarities in structure and mode of action. Curr. Med. Chem. 2010, 17, 1974–1994. effects on humans. Curr. Med. Chem. 2008, 15, 75–91. 6. Dinan, L. The Karlson lecture. Phytoecdysteroids: What use are they? Arch. Arch. Insect Biochem. Physiol. 2009, 72, 126–141. the resistance to doxorubicin in mammalian cancer cells expressing the human ABCB1 transporter J. Med. Chem. 2012, 55, 5034–5043. phosphate ester. Eur. J. Clin. Pharmacol. 1985, 29, 85–89. dioxolane derivatives, a novel group of MDR modulator agents. Magn. Reson. Chem. 2013, 51, 830−836. 10. Chou, T.-C. Theoretical basis, experimental design, and computerized simulation of synergism and antagonism in drug combination studies. Pharmacol. Rev. 2006, 58, 621−681. multidrug resistance and polarized expression of P-glycoprotein in MDCK cells. Proc. Natl. Acad. Sci. USA 1988, 85, 4486−4490. the human MDR1 gene correlates with P-glycoprotein density in the plasma membrane and is not affected by cytotoxic selection. proliferation and cytotoxicity assays. J. Immunol. Methods 1983, 65, 55−63. Sample Availability: Samples of the compounds 1–33 are available from the authors. Table 1; APCI-MS, m/z (Irel, %): 549 [M+H]+, 531 [M+H-H2O]+, 445, 427, 409.
data, see Table 1; APCI-MS, m/z (Irel, %): 563 [M+H]+, 545 [M+H-H2O]+, 445, 427, 409. APCI-MS, m/z (Irel, %): 595 [M+H]+, 577 [M+H-H2O]+, 445, 427, 409. Table 1; APCI-MS, m/z (Irel, %): 595 [M+H]+, 577 [M+H-H2O]+, 445, 427, 409.
data, see Table 3; APCI-MS, m/z (Irel, %): 615 [M+H]+, 597 [M+H-H2O]+, 445, 427, 409. Table 3; APCI-MS, m/z (Irel, %): 675 [M+H]+, 445, 427, 409. 553 [M+H+MeOH]+, 535, 503, 485, 467, 409. 13C-NMR data, see Table 2; APCI-MS, m/z (Irel, %): 589 [M+H]+, 571 [M+H-H2O]+, 499, 481, 409. NMR data, see Table 2; APCI-MS, m/z (Irel, %): 561 [M+H]+, 543 [M+H-H2O]+, 499, 481, 409. NMR data, see Table 2; APCI-MS, m/z (Irel, %): 561 [M+H]+, 543 [M+H-H2O]+, 471, 453, 409. Table 2; APCI-MS, m/z (Irel, %): 535 [M+H]+, 517 [M+H-H2O]+, 445, 427, 409.
data, see Table 1; APCI-MS, m/z (Irel, %): 617 [M+H]+, 599 [M+H-H2O]+, 513, 495, 409.
see Table 2; APCI-MS, m/z (Irel, %): 547 [M+H]+, 517, 499, 467, 409. NMR data, see Table 2; APCI-MS, m/z (Irel, %): 575 [M+H]+, 557 [M+H-H2O]+, 499, 481, 409.
and 13C-NMR data, see Table 1; APCI-MS, m/z (Irel, %): 603 [M+H]+, 585 [M+H-H2O]+, 485, 467, 409.
data, see Table 3; APCI-MS, m/z (Irel, %): 641 [M+H+MeOH]+, 623, 517, 485, 467, 409. NMR data, see Table 3; APCI-MS, m/z (Irel, %): 623 [M+H]+, 605 [M+H-H2O]+, 485, 467, 409. NMR data, see Table 1; APCI-MS, m/z (Irel, %): 575 [M+H]+, 557 [M+H-H2O]+, 499, 481.